This week marks six months since tragic wildfires in Greece killed 68 civilians, damaged 4000 homes, and charred approximately 178,000 hectares. Has there been any progress? A week after New Democracy was re-elected, Environment and Public Works Minister George Souflias set the tone by opting out of pre-campaign talk to set up a separate Environment Ministry, stating that he saw no need and no conflict in his position in which “sustainability and development must coexist.” He vowed to stop the development of fire-ravaged beachfront property in Zacharo, though the mayor and officials later signed off with no opposition. Experienced fire chiefs were replaced with amateurs, and a new law to destroy new structures on illegally seized property was tabled, but did not include provisions to deal with established homes and has only a three-member committee to monitor the entire country, where valuable land around tourist and urban areas is confirmed to be dwindling. A few homes have been demolished, but many projects are going forward without the compulsory presidential decree on land use. This includes a government-approved soccer stadium in Elaionas that will strain natural resources, and a two-story shopping mall with four-story car park in the largest remaining green area of Zografou in Athens, which will create pollution and put the municipality in serious debt. Mayors have also gone to court seeking the inalienable right to build on Mount Parnitha, one of the last remaining forests providing oxygen in a capital famous for its pollution. The only protests have come from local residents and environmental activists who can do little to stop the rich and powerful, as a forest official found out when he was fired after attempting to stop land grabbing in Corinth. Lawless land grabbing started when the dictatorship ended in the 1970s, and Article 24 was written into the Constitution to stop it. It bans any alteration to forested areas apart from reasons of national interest, and automatically schedules burnt or cleared areas for reforestation. Any construction on forested areas is therefore illegal. Later in 1983, however, the 1337/83 Tritsis law granted protection to anyone willing to declare their home illegal, and those who did not still believe that paying fines legalizes their property. Many Greeks feel Article 24 encroaches on their freedom and escape punishment for building on razed land by quoting a 2003 law, which states that a home cannot legally be established as being in a forest if there is no forest registry. And Greece is one of few countries in the world without a forest registry. There is no real priority on creating a forest registry that Souflias says will take 4 years, as it would greatly unsettle those who have grown rich from illegal property totaling an estimated 350,000 hectares with 1.7 million structures. One such beneficiary is the Church of Greece, which has inherited property from faithful parishioners over decades and seized expanses of land vacated by Ottoman nobles after the War of Independence in which priests were rulers of many villages and the Greek Orthodox Patriarchate had control of schools and courts. As recently as January, monks at Mount Athos were accused of staking illegal claims to land in a Halkidiki resort area. The Greek Orthodox Church is the second largest landowner in both Greece and Israel, though it ironically pledged only 500,000 euros to Greek citizens of which 99 percent say they are Orthodox faithful. And what about the people? Private donations poured in to help them — initially reported to be 300 million euros in September, revised to 151 million in October, then 160 million in February — but the only money spent as of January was 2.7 million on anti-flood works built by unsupervised, untrained military troops without equipment, and emergency support for farmers. Most victims remain homeless and live in prefabricated homes because of applications mired in red tape. In addition, volunteers on the ground report that aid is not getting to those who need it most, with supplies being taken by non-victims. 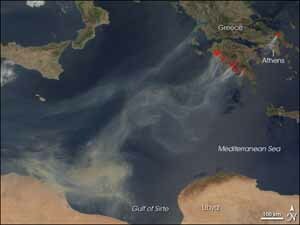 The EU approved more than 2.2 billion specifically for areas affected by fires to offset the 2.1 billion in damage, though the Greek government claims to be in debt and deficit. There is also 91.6 million in unclaimed EU funds for environmental projects that have not yet started, though six coal-powered plants are being built and a national zoning plan was unveiled to pave the way for more land grabbing. EU Commissioner for the Environment Stavros Dimas publicly expressed his disapproval for the lack of progress in Greece and called for greener measures, but was accused of ingratitude to a country that made him and called unpatriotic for not sweeping his homeland’s shortcomings under the rug. I know how he feels. No doubt I’ll be told to burn in Hellas for not doing the same. Sadly, things in Greece will get worse before they get better. Greece is full of scandal and corruption that has reached the bone marrow, but one look at the land-forest-fires-environment-ministry conundrum will convince you that things can be a lot worse than originally thought. The absence of a property registry (cadastre) and a forest registry; high taxation on real estate despite recent legislation affecting close relatives favorably; the intertwined networks of corruption and money laundering inside ministries; and the collusion of politicians with local authorities and “law enforcement” create an explosive brew. Ironically, Greece – the EU member, the ‘respected’ NATO ally – is the one country with the most need of a comprehensive plan for land reform and a radical overhaul of property laws. And we should also not forget that illegal practices involving land and property are now so widely practiced that any real effort to change things should send 2/3 of the population to jail (come to think of it, this may not be all that bad a turn of events). What a nightmare and frankly the last poster Theophilos is a good example of why Greece is in the condition it’s in. The idea that it could be worse somehow makes it okay for it to be as bad as it is, that is a refrain you hear EVERYWHERE in Greece! “oh no, it’s not so bad, you should see —–” give me a break!! At this point, I don’t see why displaced families take to the streets or build their lean-tos in Syntagma or by the entrance to the Acropolis – perhaps the shame that will be visible to all will induce some sort of action. I think you missed the point of my comment entirely because, obviously, you did not read it correctly. You should do a second reading; you should also refrain from expressing an opinion such as the one above without having actually understood what the poster says.